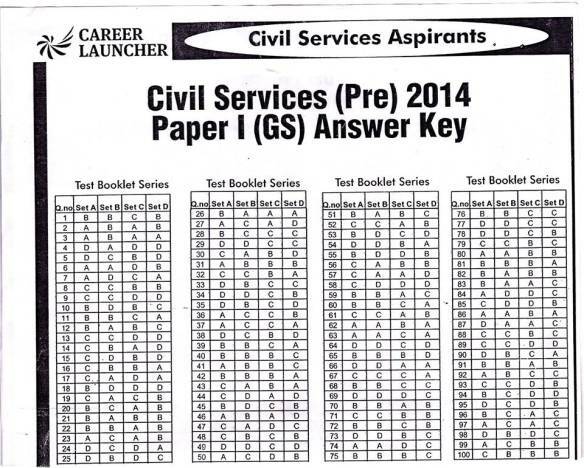 UPSC Prelims 2014 Answer Key and Cutoff Discussion for Paper I and Paper II. CSAT UPSC IAS Prelims exam answer kay for Paper I and Paper II held on 24th August 2014 at various location in India. This year UPSC exam in trouble since beaning and it was felt in the prelims exam. Paper I was little tougher and paper II was tricky. Hindi conversion of the paper was toughest ever in the history of UPSC Civil Services Exam. There are around 4.5 lacs student appeared for the exam this year, previous year around 3.38 lacs- an increase in more than lacs candidates. This year Paper II was tougher but easier for guys preparing for MBA, Banking, SSC etc.